• California's outspoken governor takes aim at Rush Limbaugh on "Today Show"
SACRAMENTO, California (CNN) -- Rush Limbaugh likes to call himself "The Most Dangerous Man in America" because critics have long worried about how his powerful radio show shapes the political landscape. And then came California Gov. Arnold Schwarzenegger, who frankly told "The Today Show" Tuesday that "Limbaugh is irrelevant." It was a shot aimed at Limbaugh's loaded term for Schwarzenegger -- "closet liberal." "I don't know what happened to Arnold," the conservative talker said on his radio show. "He obviously didn't have the leadership skills to articulate conservative principles and win over the public as Reagan did." 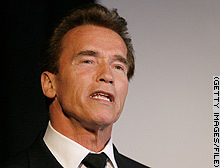 Some political observers said Schwarzenegger's smackdown is a sign Limbaugh is not the dominant force he once was. Back in the day, his was the only conservative voice on the airways. Now he's one of many. But others say Limbaugh's power has always been a myth. "For all of his power and all of his fame, Rush Limbaugh, during his ascent in the '90s, bashing Bill Clinton on a daily basis, hours on the radio every day coast to coast, was not able to un-elect Bill Clinton," said Michael Harrison of Talkers Magazine, a trade magazine for talk radio. Conservatives credit Limbaugh for the Republican takeover of congress in '94. But, Harrison said, Limbaugh is struggling now that his party has lost power to the Democrats -- and because there is no leading Republican candidate he can tout wholeheartedly on his radio show. "They're good guys, they're Republicans, but they're not conservatives," Limbaugh said of the candidates. "I happen to be a conservative, and I happen to be oriented toward conservative triumph, and conservatism won't triumph if we water it down and dilute it and say that people are 60 percent conservative or whatever, happen to be the definition of new conservative." None of this means you'll hear any Republican running for president disrespecting Limbaugh -- they're still in the business of not offending anyone with as wide a following as Limbaugh has. Although he's a Republican, Schwarzenegger -- who can't run for president because of the Constitution's ban on foreign-born presidents -- is free to say what he pleases. California Gov. Arnold Schwarzenegger shot back at his critic Rush Limbaugh by calling the conservative radio host "irrelevant" on The Today Show. Do you agree with Arnold Schwarzenegger's description of Rush Limbaugh as "irrelevant?"